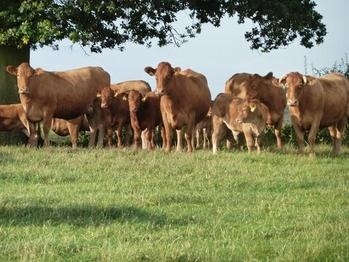 The Welland Valley Herd of 130 cows was started in 1994 at Manor Farm, Thorpe Langton, Near Market Harborough on the edge of the Welland Valley, renound for its good grazing land. Foundation females were purchased from traditional South Devon herds such as Trevassack, Edmeston, Shutterford, Pittescombe and Tregotha, together with bulls from the Stretchford and Waddeton herds giving us some of the oldest blood lines in the breed. We have tried to breed big cattle with strong bone and natural fleshing without excessive muscleing. In 2010 we had a reduction sale selling 100 cows and followers, with a record attendence and Welland Valley cattle travelling all over the country. Performance recording was started some years ago with Breedplan, the farm is also FABBL Assured, SAI GLOBAL. We are in the biobest hihealth herdcare scheme. TB Status, yearly testing. The Welland Valley herd has had considerable success in recent years at National Shows and also South Devon Herd Book Society (SDHBS) Shows & Sale. In addition to the South Devon herd a flock of 200 breeding ewes, mainly Suffolk X Scotch Half Breds are kept for producing prime lambs and shearlings sold for breeding.